I just did two-color double knitting for the first time ever! I am so excited. I tried to learn it from Knitty Gritty a while ago and it soared over my head, but I guess I've advanced enough since then. Details to follow, I literally just watched Lucy Neatby's tutorial, did the technique, pressed paused, and came over here to blog about it. Iiiiiii am the champion, my friends!! p.s. If you ever doubted that Lucy Neatby's instructional videos are worth the money, start saving up NOW. These things are awesome. 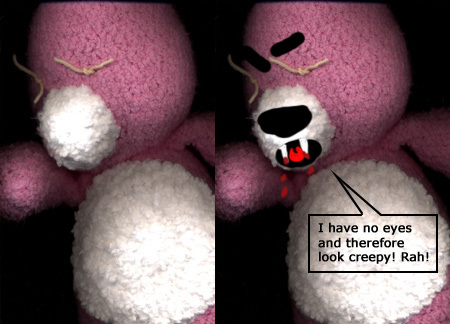 Isn't it funny how un-loveable stuffed animals look without eyes? I finished the basic construction of Kalynn's birthday Care Bear tonight and his eye place-holders are creeping me out. Hopefully he will become cute and cuddley after I make eyeballs and decide what to put on his belly. I am halfway done making a crocheted Care Bear for my niece and it's coming along quickly. (Head, two legs, one arm, and half a body in 2 days of diligent work.) The pattern is written fairly well and the shaping is accurate enough that if you can handle crocheting with fur, it looks almost like the real thing rather than "my mom made it for me because we can't afford a real one". Having been fooled by an off-brand Luck Bear in my own childhood, I am satisfied that this bear will pass a 5-year-old's standards. I used Berrocco Plush in pink for the body (I'm a glutton for punishment) and Plymouth Heaven for the belly & muzzle. I considered using plain old Encore, but I figured the hassle of working with the Plush would be worth it for the softness. Complaint of the day: This pattern calls for, and I quote, "Medium worsted weight yarn. Body color - 2 skeins." TWO SKEINS OF WHAT?! A skein is not a preset size, where two 50 gram "pint balls" always equal a 100 gram "quart ball." I looked up the definition to make sure I wasn't mistaken and found almost the same wording every time: "a continuous length of yarn or cord of any desired length, in the form of a collapsible coil." Asking for two skeins of yarn could literally leave you with anywhere from 10 to 5,000 yards. It's not just this pattern, either. People come into the Woolie Ewe all the time with them, mostly patterns from years ago but not always, that call for "two balls of yarn." Whoever published these patterns should be retroactively fired from their jobs. Along with the pattern writers that call for "2 ounces of baby yarn" without telling you what fiber content they intend for you to use. Cotton is WAY heavier than wool, so two balls of yarn, one in cotton and one in wool, both in the same weight and gauge, will give you drastically different yardages. Not to mention nowadays baby yarns are mostly synthetic to make them washable and hypoallergenic, so there's no telling what the subtle difference in weights are between acrylic, nylon, polyester, microfiber, and all their blends. I think the only reasonable occasion to not include yardage in the pattern is to purposely stop people from substituting. For example, If you are a yarn company and you want people to knit your patterns using only your yarn, I think it's ok as long as you specify "2 balls of So-n-so Brand yarn." I want to sing it from the rooftops: Always go by yardage, not by weight! and You can't always substitute ball-for-ball, you have to do the math! and Unless you're prepared to scrap the whole project when you run out of yarn, quit being such a cheapskate and buy an extra ball! First order of business: My Transformers sweater (which, by the way, was not enough to win us the "biggest fan" video contest we entered) is the most comfortable thing I've ever worn. Even though the fabric is thick and heavy, the garment itself is not warm. I wore it to work and was no hotter than usual. The real test will be wearing it now that the summer heat has really set in; next time the forecast is 100+ I am going to wear it to work again and see what happens. Living in a hot city like Dallas and planning to move back to an even hotter city like Houston, I am always on the lookout for cool yarns. This is my favorite sweater ever. ...However, disaster struck when I put it in the washer. The tag on Plymouth Oh My says "machine washable" with no further disclaimers, so I put it on gentle cycle thinking I was playing it safe. When I pulled it out of the washer, I almost fainted. There were a ton of little strands of yarn tangled and wrapped around the sweater and a giant hole on top where the green background meets the white logo. I managed to pull myself together enough to start cutting strands away and it turns out that all the tangles were just my cut ends coming unraveled, but they were all still attached where they should have been with the exception of the one hole. The yarn is constructed rather like a little i-cord, so when the end is cut it comes undone. (My advice for those working with this yarn is to scrap the usual "never tie knots" rule and tie a small, single knot at the very end of every strand after you weave in. Also, weave in a longer tail than usual so that in the event of unraveling, you still have enough there to remain secure.) I painstakingly repaired the hole on the front with very little lasting damage. The top of his head is a bit crooked, but I am very proud of the surgery I did on him. Secondly, I finished my mock-cable cardigan and it is everything I hoped it would be. I spent a full 16 hours weaving and seaming, 8 of which were devoted entirely to getting the zipper in exactly right. I knew I had succeeded when the girls at work couldn't tell it was a cardigan rather than a pull-over until I unzipped it. It took 18 balls of Debbie Bliss Cashmerino Chunky (not Superchunky, as they are commonly confused with one another) and is worked on size 9 & 10.5 needles. This one is the exact opposite of the Oh My sweater and it's warm to the point of stifling. I've only been able to try it on long enough to catch a quick glimpse in the mirror and then rip it back off again lest I suffer a heat stroke. I guess this one will be shelved until next winter. 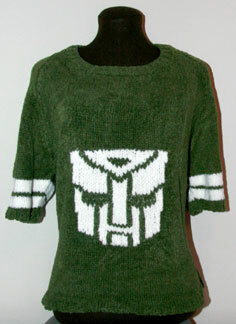 At first I was kicking myself for not having designed the sweater in a way that was able to be resized easily. The pattern repeats are done over such a large amount of stitches that removing one would downsize the garment by about 4-5 sizes at a time. But it appears fortune was smiling down on me, for when the sweater was done I realized just how stretchy it is. Laid flat, the sweater is about 34" at the bust, but the cables & ribbing easily stretch to fit me at about 44". I suspect it might even embiggen itself further if needed for someone larger. So I will be able to market this pattern for sale after all, under the guise of a "one size fits most" disclaimer. Speaking of hot weather and cool yarns, there is one made by Needful that claims to not only protect you from UV rays, but also keep you feeling 9 degrees cooler. It's called Ceramic, because (obviously) it is made with 5% ceramic. How is this even possible? Who knew ceramic was spinnable? The Woolie Ewe has this stuff for sale and I would love to hear testimonials from anyone who has used it. A guy who wondered where his cat went during the day decided to mount a camera on its collar. This website has all the details about making the contraption, and a photo gallery of the cat's adventures. Crochet Today is quickly becoming one of my most anticipated magazines for its awesome selection of stuff, but why on Earth do they pick such lame projects for their cover? I love the shoe-flower decorations, the granny square pillows, and the circle tank top. The doily-on-the-wall idea makes my inner artist smile. But then they went and put a zig-zag afghan on the cover. (Dear God, deliver us from Red Heart. I can smell the moth balls from here.) Perhaps there was a mix-up; this project was supposed to go on the cover of Crochet Yesterday magazine. I suppose the argument could be made that afghans appeal to everyone and they will therefore sell more copies by having a broad appeal on the cover. BAH! If you're the type to pick up a magazine and say "Oooo, a zig-zag afghan! This looks like the magazine for me!" you will inevitably be disappointed when you look inside and see that there are no crocheted air-freshener-covering doll skirts or TP cozies. 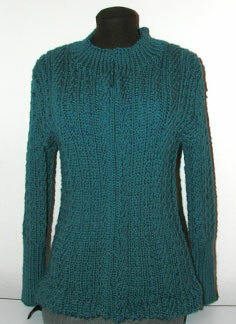 I finally finished my mock cabled Debbie Bliss sweater. Just in time for the Texas heat to reach 92 degrees today. Everyone at the store liked it, but I can't stand modeling it for more than 10 seconds at a time because it is very, very warm. I must say I am very proud of the job I did sewing the zipper in. I would upload pictures, but Adam is video gaming on the picture-getting-computer. In other news, my oldest friend Angela found out she is HAVING A BOY! She's due in late October, which gives me plenty of time to knit gender-appropriate items in addition to the stuff I've already made.